Star Wars Rebels slows down to deal with the loss of a key character by allowing everyone to deal with it in their own way. The previous episode had a shocking ending that has widespread implications for the show as it moves into its final episodes. Hera has lost the man she loves, Ezra has lost a mentor and everyone else has lost a dear friend so taking the time to process this is absolutely the right thing to do. Hera is understandably grief stricken and spends most of the episode contemplating what life is like without Kanan. The Kalikori acts as a symbol of their relationship and a reminder of him since he went through a lot to retrieve it for her. The fact that it has a missing piece clearly indicates that Hera has lost a piece of herself while also providing a space for his memory to live on as part of her family. So much is attributed to such a small object but the weight of meaning is heavy. Chopper is the only company Hera has for much of the episode which feels right. The Ghost crew have always been a family with Hera as the maternal figure so Chopper would effectively be one of her children. Hera feels comfortable opening up to Chopper and definitely sees him as more than a machine. The moment Chopper holds her hand is emotionally satisfying and encapsulates this relationship perfectly. Hera has a decision to make. She can either give up on her mission and the Rebellion or find a way to move forward with renewed determination. She has experienced loss before in the various battles she has been involved in but this is a deeply personal one and it affects her differently. Some time to reflect is essential and she has to take stock of what she’s fighting for in her own mind before continuing. By the end of the episode she resolves to fight for Kanan which gives her a strong motivation going into the final episodes. Ezra takes the Jedi approach to processing his grief. He meditates and tries to take charge of his emotions in that way which works to a degree. 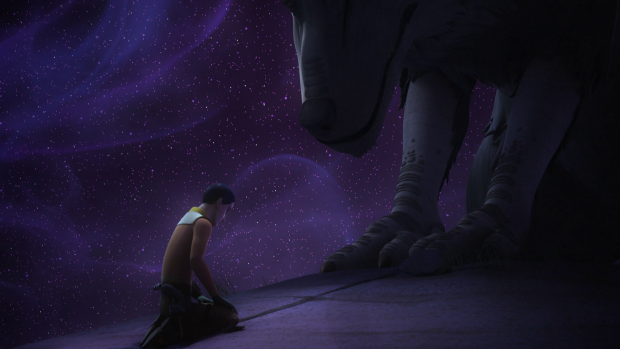 The Loth Wolves approach him and give him vague guidance on what he should do next. Ezra is clearly frustrated and feels guilty over his inability to save Kanan so lacks the patience to fully consider the advice. One of the Wolves identifies itself as Dume which was Kanan’s name so my thinking is that the Wolves behave similarly to Force Ghosts by allowing the spirits of fallen Jedi to live on. The whole thing is a vision with some really impressive ethereal style visuals clearly indicating that something otherworldly is at play. His vision gives him what he needs to plan his next move. It will involve the Jedi Temple in some way but their are warnings associated with the next steps. Both “Knowledge” and “Destruction” are mentioned so it’s clear that the next step on the journey won’t be an easy one. Ezra is already in uncomfortable territory as he is unable to go to his mentor for guidance. His next move is very much his own and the implication is that there are much larger stakes than he has previously experienced. It’s a classic storytelling technique to have a character tested on something huge before they feel that they’re ready and it’s handled very well. This vision is the right kind of foreshadowing as there is an effective mystery element to it. Sabine and Zeb process their grief by taking affirmative action. They want revenge on those responsible for Kanan’s death and find the notion of the Empire holding a parade to celebrate their victory offensive. Sabine talks about adding fireworks to it but it never gets to that stage as they are interrupted by a battle with Rukh. Amusingly Zeb finds the sight of him disgusting though the reasons for this are never explained beyond Zeb taking exception to him. Still, this does offer levity in an otherwise morbid episode. It’s justifiably morbid and the levity doesn’t overpower it so the variety is certainly welcomed. The fight between Sabine, Zeb and Rukh is really well done. The cloaking mechanic made it exciting and allowed the intelligence of the characters involved to come into play. Sabine’s idea of covering him in paint to make him visible was perfectly suited to her and made for a striking visual. Zeb’s violent approach to the fight works to a point but Rukh is a lot faster so both characters are necessary to bring him down. Sending him back to the Empire as a message that the Rebellion isn’t finished yet was a really nice touch. Some comfort can be taken the knowledge that Kanan didn’t die for nothing. His sacrifice was after Pryce foolishly destroyed the fuel supply meaning that production of the TIE Defender has ground to a complete halt. Thrawn fully intends to punish her for this as what was achieved in no way outweighs the loss. As interesting as this was it feels somewhat unnecessary in an episode that should have been devoted to the Ghost crew processing their grief. Knowledge that production had stopped was enough for now with there being no need to check in with the villains. Zeb and Sabine are able to bring back the news that production has stopped which gives everyone hope as it’s clear that Kanan’s death wasn’t meaningless and that the Rebellion are achieving something. This provides the necessary hope for the coming episodes and solidifies the drive to keep fighting. An excellent episode that focuses on the characters and their unique ways of processing their grief. 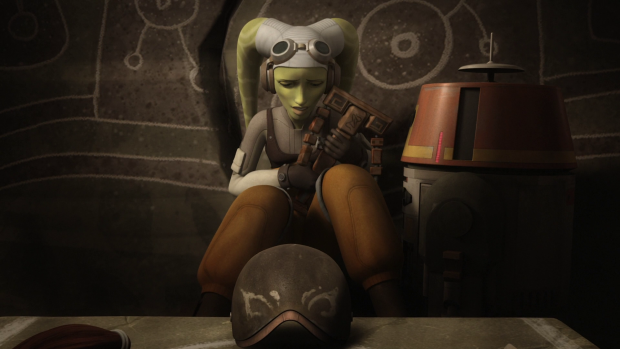 Hera struggles with the notion of either giving up or carrying on after such a profound loss and has very meaningful emotional moments with Chopper as she resolves her feelings. Ezra takes the Jedi approach and meditates which results in him having a vision that offers clues to the future while remaining suitably cryptic. Ezra’s frustration and grief mean that a lot of this goes over his head but the next move is clear. 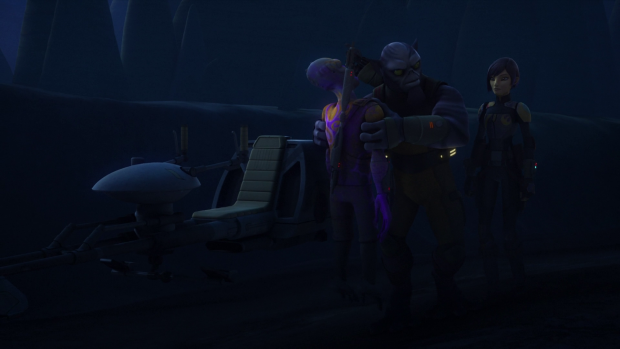 Sabine and Zeb take a more action based approach to dealing with their grief and look for revenge against the Empire. Together they take down Rukh in a really well executed action sequence and determine that construction of the TIE Defender has stopped meaning that Kanan didn’t die for nothing. 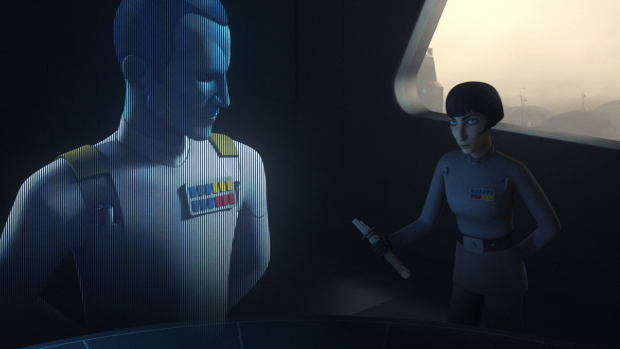 The episode also informs us that Pryce will be punished by Thrawn for her actions which felt unnecessary for such a character driven episode.